Weekly Recap #14: Plot Twist! Due to an unexpected turn of events, we’ve done some redecorating in our schedule. We’ve got a golden opportunity of merging working on Grindea with schoolwork, and we felt we had to take it! The flip side was that, since it’s a project course, we needed a somewhat isolated element of the game that would take about five weeks to complete. 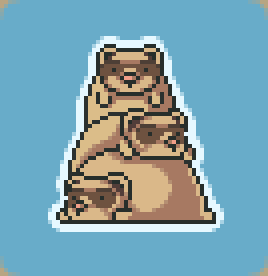 To get our minds of that dark lining of the silver cloud, here are three very anatomically correct ferrets on top of each other! This is our logo! We’ll have to throw together some nice font that says “Pixel Ferrets” too, but this is the core! We felt it was about time to get one, being nine months into development and all. The area we’re going to create is temporarily called the Halloween Forest, but we plan on changing the name to something a bit more fun later on! The zone is somewhat scary (as you probably figured out from the name) yet still cute. The enemies and decorations will include things such as pumpkins, lanterns, candle lights, scarecrows, ghosts, mist and spooky trees. This is the home of the odd Candy Witch, a couple of wicked twins and a mysterious hooded man. It’s also here you will have the chance of helping a lonely scarecrow in a quest! This is one of our favourite areas (at least to talk about) so we’re looking forward to a few entertaining weeks for all of us. We hope you’ll will like it as much as we do! In-between all the planning of our new schedules and preparation for the new course, Fred has kick started operation Halloween Forest with its very first inhabitant, a little jumpin’ pumpkin! There’s plenty more enemies to come during the following weeks; we have a total of five planned for this area. Next Week: Enemies! Trees! Stuff! Halloween!